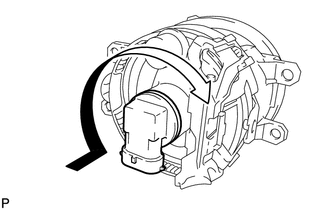 (a) Turn the fog light bulb in the direction indicated by the arrow shown in the illustration and remove it. 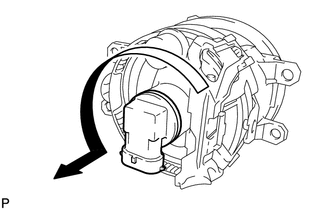 (b) Disengage the 2 guides and remove the fog light assembly. It is possible that a bulb is incorrectly installed, affecting fog light aim. Bulb installation should be considered prior to performing the adjustment procedure. Ensure there is no damage or deformation to the body around the fog lights. Make sure that the oil is filled to the specified level. Make sure that the coolant is filled to the specified level. Inflate the tires to the appropriate pressure. Unload the trunk and vehicle, ensuring that the spare tire, tools and jack are in their original positions. Sit a person of average weight (68 kg, 150 lb) in the driver's seat. Place the vehicle in a location that is dark enough to clearly observe the cutoff line. The cutoff line is a distinct line, below which light from the fog lights can be observed and above which it cannot. 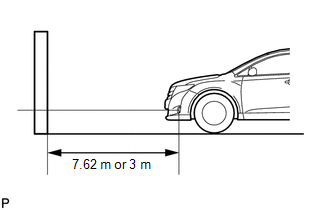 Place the vehicle at a 90° angle to the wall. 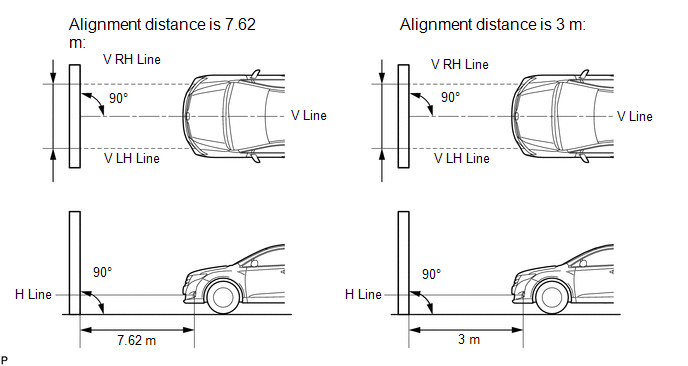 Create a 7.62 m (25 ft.) distance between the vehicle (fog light bulb center) and the wall. Make sure that the vehicle is on a level surface. Bounce the vehicle up and down to settle the suspension. (b) Prepare a piece of thick white paper (approximately 2 m (6.6 ft.) (height) x 4 m (13.1 ft.) (width)) to use as a screen. (c) Draw a vertical line down the center of the screen (V line). (d) Set the screen as shown in the illustration. Stand the screen perpendicular to the ground. Align the V line on the screen with the center of the vehicle. 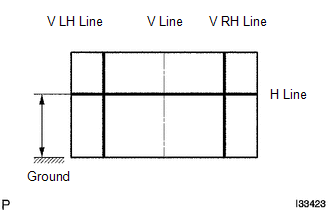 (e) Draw base lines (H, V LH, and V RH lines) on the screen as shown in the illustration. Mark the fog light bulb center marks on the screen. If the center mark cannot be observed on the fog light, use the center of the fog light bulb or the manufacturer's name marked on the fog light as the center mark. Draw a horizontal line across the screen so that it passes through the center marks. The H line should be at the same height as the fog light bulb center marks of the fog lights. Draw two vertical lines so that they intersect the H line at each center mark (aligned with the center of the fog light bulbs). 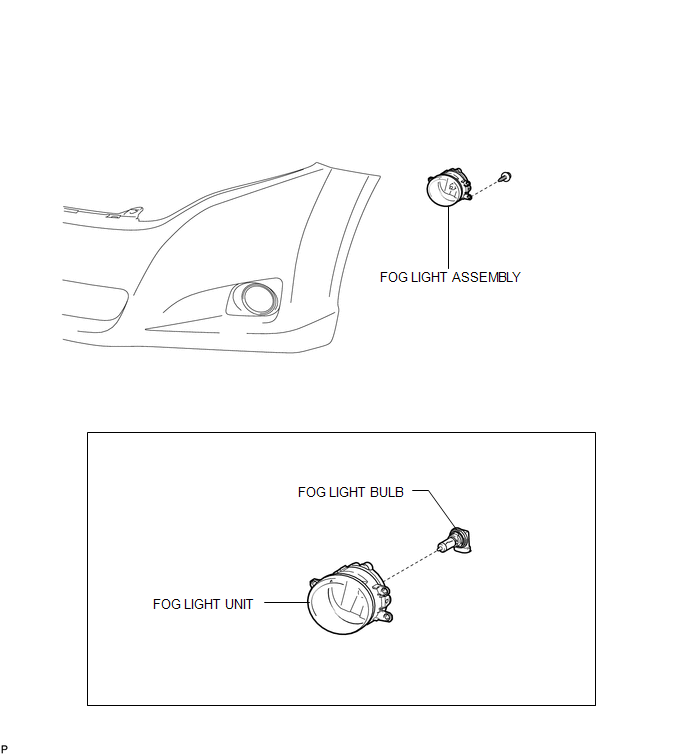 (a) Cover the fog light or disconnect the connector of the fog light on the opposite side to prevent light from the fog light that is not being inspected from affecting the fog light aiming inspection. Do not keep the fog light covered for more than 3 minutes. The fog light lens is made of synthetic resin, which may melt or be damaged due to excessive heat. 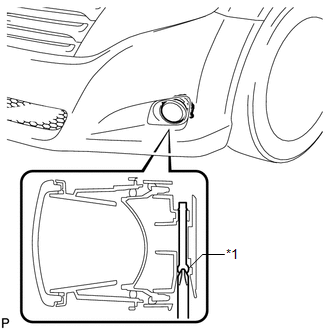 (c) Turn on the fog lights and check if the upper edge of the hot zone for each fog light matches the upper edge as shown in the illustration. The upper edge of the hot zone for the fog light should be 106 mm (4.19 in.) below the H line. The upper edge of the hot zone for the fog light should be 42 mm (1.65 in.) below the H line. Adjust the aim of each fog light to the specified range by turning each aiming screw with a screwdriver. The final turn of the aiming screw should be made in the clockwise direction. If the screw is tightened excessively, loosen it and then retighten it, so that the final turn of the screw is in the clockwise direction. If it is not possible to correctly adjust fog light aim, check bulb, fog light unit and fog light unit reflector installation. 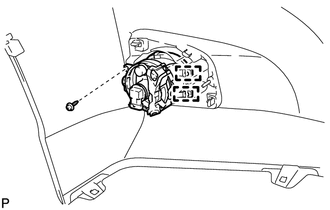 (a) Turn the fog light bulb in the direction indicated by the arrow shown in the illustration to install it. (b) Install the fog light assembly with the screw.